The Phi Phi Islands of Thailand's are truly like paradise with mammoth limestone cliffs that seem to reach into heaven, and mesmerizing coral reefs that sparkle beneath the crystal clear waters of the archipelago. 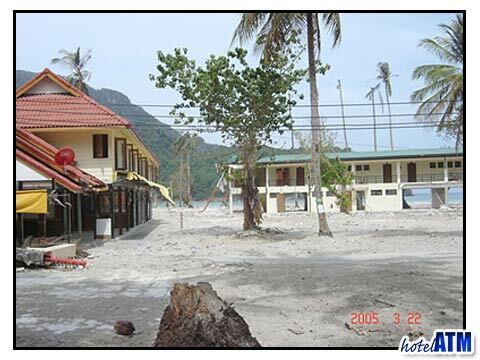 The tsunami of 2004 changed all that and Hi Phi Phi stepped in to help the local inhabitants. However, what was paradise, became "paradise lost" when the Indian Ocean Tsunami struck Phi Phi Island at 10am, 26th December 2004, slamming into the main tourist island - Koh Phi Phi Don - killing more than 1,500 people, destroying businesses and homes. The island of Phi Phi Don was declared uninhabitable. Homes and lives were literally destroyed in a matter of minutes. As Phi Phi Ley, Bamboo Island, Mosquito island were uninhabited the full effect was mainly on Phi Phi Don. What Is Hi Phi Phi? After the tsunami, in the midst of all the terrible destruction, came a glimmer of hope called through Hi Phi Phi (Help International Phi Phi) founded by a former Phi Phi Island resident - Emiel Kok. Hi Phi Phi a relief charity, helped the people of Phi Phi rebuild their lives. The community based organization made up of islanders and volunteers from all over the world worked together to clean streets and reefs and rebuild homes to return Thailand's most prized tropical paradise to its original state. This unique group of volunteers and local Thais were like angels sent from above to give desperately needed assistance to the residents of the Phi Phi Islands. Immediately following the tsunami, the first priorities of Hi Phi Phi were to house and feed refugees who were left with nothing but the clothes on their backs. The work was physically, as well as emotionally devastating. The temperatures were brutal as men and women worked, unearthing bodies and retrieving passports and ID cards, which became vital evidence for families earching for their loved ones. While some Hi Phi Phi volunteers dug, others cleared streets, replanted scrubs and palm trees and took on the daunting task of rebuilding homes. Thousands of Hi Phi Phi volunteers have passed through the Phi Phi Islands and have donated their time, offering everything from carpentry to architectural planning services. They have consoled the people of the Phi Phi Islands and helped them rebuild their lives. The Hi Phi Phi website still gets thousands of hits to this day, and may survivors go to the site for support. The Hi Phi Phi now lends it support to local charities to aid in long-term matters like construction and care for the children of the island who were orphaned when the tsunami struck. When it comes to reaching a goal, the Hi Phi Phi certainly met the challenge of playing a huge part in resurrecting the Phi Phi Islands. Hi Phi Phi, a unique collaboration of foreign volunteers and local Thais, which has transformed the shattered Phi Phi Island's fortunes.